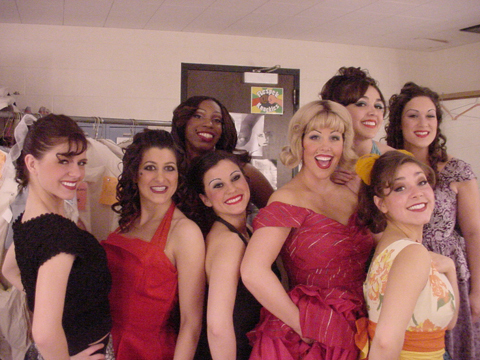 April 20, 2006 | A hallway of dressing rooms, a chock-full cast of more than 40 people, loud up-beat music, bright vanity lights, make-up everywhere, and the scent of hairspray filling the air-backstage is the place to be if your about to perform in West Side Story. 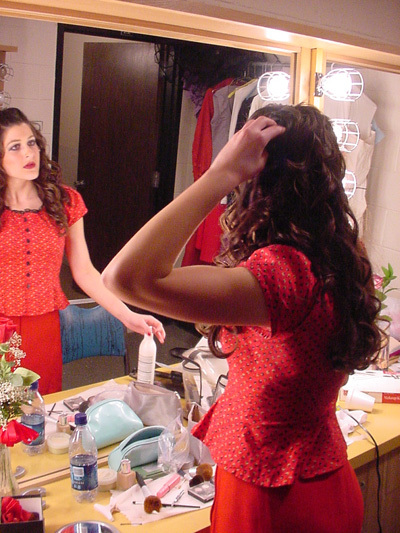 So many emotions are tossed about right before a performance: nervousness, excitement, fear . . . that's why most members of the cast have a routine they go through before the show to prepare. The majority of the actors usually go through a physical and vocal warm-up so they can do their best to shine on-stage. Some cast members stop eating at least four hours before a show. Others pray for a successful run. Many try to forget all of their everyday problems so they can focus on the intentions and personality of the character they are playing. "I have a mantra of whatever I want each time I go onstage," Chris Martin, a.k.a. Bernardo, said. Martin usually runs around to keep his energy high. He said he likes it quiet right before he goes out to perform. Martin said oftentimes he gets cranky because of the noise going on backstage. "It takes a lot of focus to go out there and bang it out every night," he said. While many of the actors try to shake their anxiety before a show, some have a simpler thought process. When Richie Call, Tony, was asked what runs through his mind before he enters the stage he said the main thing he usually worries about is if his fly is undone or not. Although actors may worry about how they'll be on-stage, most can't get enough of the thrill from being in the spotlight. "One of my favorite sounds in the whole world is sitting just off-stage before a show starts, before the houselights dim . . . " Call said. He said there's a chit-chatter about daily life from the audience and a certain busy ambiance. "There's this really excited buzz, I just love to sit there and think, 'Oooh! We're about to go out!'" Call said. Jessica Hyde, who plays Anita, said she likes everything about being on-stage. "You're able to let go of all of your problems and release. There's nothing like being on-stage," she said.